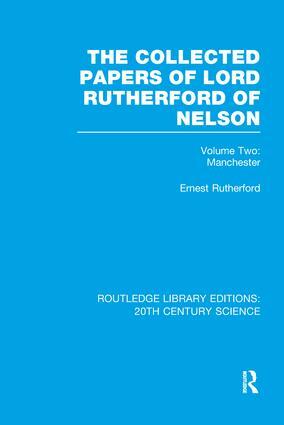 This is the second of three volumes which together contain the complete range of Lord Rutherford’s scientific papers, incorporating in addition addresses, general lectures, letters to editors, accounts of his scientific work and personal recollections by friends and colleagues. Volume two, first published in 1963, includes the papers published by Rutherford when professor of Physics at Manchester, 1907 to 1919. While the work of his laboratory ranged over the whole field of radioactivity, he himself devoted much effort to questions concerning the nature and properties of the α particle. Consideration of the scattering of α particles led him to the second of his outstanding achievements, the conception of the nuclear structure of the atom, which opened up a new era in Physics.